Happy European young woman using smartphone, then making a phone call and talking to friend at Brooklyn Bridge, NYC 4K. Youn designer with smartphone, making a phone call. Attractive adult European woman talks to friends using smartphone video call app at Brooklyn Bridge, New York city 4K. 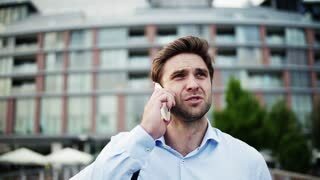 Happy successful European businessman makes a phone call on smartphone, talking and smiling near Brooklyn Bridge 4K.